Average Height	: 30" - 34"
Average Weight	: 90 - 130 lbs. The Akbash is most likely one of the older breeds still existing today, and much of its history remains mysterious. 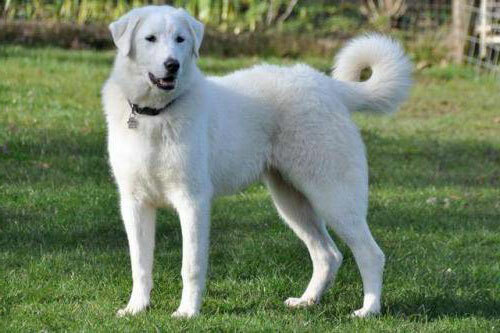 Their white coat (which gives the breed its name, "akbash" meaning "white head" in Turkish) implies to some scholars that the dog was bred to blend in with its flocks, making it seem less threatening and making it easier for the dog to catch predators--the white Akbash would be less visible from a distance, making predators less likely to use their cunning in order to sneak members of the flock away from under the dog's long nose. This theory is backed up by the Akbash's sister breed, the Karabash ("black head"), which is commonly used for flocking and herding in areas where an all-black coloration would serve the same camouflaging purposes. Despite the longevity, proud temperament, and striking appearance of the breed, it has yet to find popular acceptance in dog breeding circles. The United Kennel Club formally recognized the Akbash Dog as a breed in 1999, but many other kennel clubs worldwide have thus far remained on the fence. Due to the breed's growing popularity in North America, Akbash Dogs International has formed as a rival kennel organization to ensure genetic regularity over the breed for dog owners outside of the breed's native Turkey. The Akbash Dog is a proud beast, bred to be the guard of his or her pack of flocking animals. The Akbash ensures instant obedience on the part of the flock and a much easier time of protecting the dog's charges from predators. But it can be an extremely challenging quality when it comes to training an Akbash, or simply for using it as a family companion dog. The Akbash Dog does well under human authority when that authority is clear and decisive, but when the Akbash's masters show signs of inconsistency or weakness, the Akbash is quick to challenge for pack supremacy. This holds true even after the Akbash is adequately trained during its puppy years--challenges for dominance happen throughout the dog's life, and although the dog is content to remain in a lower position in the hierarchy for a long time, he or she isn't content to remain in that lower position when a higher position--your position--becomes available. So consistency in training and handling is always required of any successful Akbash Dog owner. The Akbash Dog does very well with other animals. Any aggressive behavior on the part of the other animal will usually be put down quickly (and non-violently) by the Akbash Dog, and non-agressive behavior will be tolerated. Other aggressive dogs (or other aggressive Akbash Dogs) are the most problematic in this department, and naturally submissive dogs--including the submissive personality variant of the Akbash Dog--will make the best companions for this breed. Akbash Dogs have a strong bonding instinct with other animals, and the earlier an Akbash Dog is exposed to another animal, the more likely it is to form a protective bond. The Akbash Dog also does well with children, usually thinking of them naturally as members of the flock to be protected. Because of the breed's obsession with pack hierarchy, however, children should not be allowed too much contact with the Akbash Dog during crucial periods in the dog's development--most importantly from six to twelve months, but to a lesser extent for the first two years of its life. The Akbash Dog spends much of this period of time "acting out", constantly challenging pack authority, and children can become the unwitting targets of this dominant behavior. Although this doesn't usually mean potential harm to your children, it can mean an erosion of the Akbash Dog's vital training, and should thus be avoided. Akbash Dogs are not the most energetic dogs in the world as a rule, being bred to spend most of their time resting and guarding their flocks. But they are capable of exuberant behavior on occasion (particularly in early developmental years), and they do need regular exercise in order to keep them healthy and happy. An Akbash Dog who's kept indoors for too long typically becomes listless and dispirited, eliminating much of the quiet charm of the breed. As a herd guarding dog, the Akbash Dog thrives on the presence and companionship of humans. Although it can function for moderate periods of time alone--being bred to act independently as a flock guard without much human intervention--it will always do better with other "pack members" as constant companions, and can't be left alone for too long without human contact. Dogs behave destructively when they feel themselves abandoned, and with such a potent destructive force as the hundred-plus pound Akbash Dog, it's important to keep that destructive behavior to a minimum whenever possible by ensuring adequate contact with your dog. The Akbash Dog is extremely healthy, with isolated cases of hip dysplasia (common to all larger dogs) and joint inflammation ( osteochondritis dissecans ). Akbash Dogs International requires a hip screening as part of its breed standard, and efforts are being made to reduce genetic joint conditions from the overall Breeding stock. Because the Akbash Dog was bred as a guardian dog, meant to spend most of its time outdoors with its charges, its coat has developed to the point where it requires little maintenance. The hard outer coat will usually not mat or tangle, but a weekly brushing in order to remove those mats or tangles that do occur isn't a bad idea, however, you'll still have to deal with periodic shedding of the insulating undercoat, usually twice a year during seasonal changes in the weather of your region. Despite the musculature and size of this dog, the Akbash Dog is not very active. This makes sense when viewed in the context of the breed's intended purpose: Akbash Dogs were expected to travel slowly and carefully with a flock when it was on the move, and to lie quietly with the flock when it was at rest to better protect it from predators. Because of these genetic tendencies, the breed today is likely to prefer lounging to rambunctious activity--no doubt a plus to some owners who are concerned about providing adequate excitement for this large and unwieldy-looking dog. However the Akbash Dog does have the capacity for high-energy exercising, and will require this kind of activity on a regular basis in order to stay healthy and happy. A fenced yard is the best way to give your Akbash Dog this kind of exercise, and the dogs should be allowed about two hours every day of free play in their enclosure. By "fenced yard" we don't mean a typical suburban backyard: in order to run and play adequately, an Akbash Dog will usually require at least half an acre of open space. The Akbash Dog's proud disposition will tend to make it less active when on the leash, and although he or she will no doubt appreciate the exercise, he or she will get less out of it than they would an open play environment. Akbash Dogs are very pack-oriented and will take well to training, provided that you adapt your training style to the personality type of the dog. All dogs come in two basic personality variants--submissive and dominant--but with Akbash Dogs, the split between these is much more pronounced, and successful training will depend on a successful assessment of your Akbash Dog early in its life. Training submissive dogs is easier, and requires only the basics of dog training in order to be successful: consistent commands, a focus on positive rewards for good behavior rather than strict, negative correction for bad behavior, and of course patience. Training dominant dogs, however, requires you to do more than this. A dominant Akbash Dog is a guardian dog, and naturally assumes a dominant role in his "pack" of herding animals. If you don't assert your dominance--and maintain it, despite the dominant Akbash Dog's frequent challenges to authority--then you'll be unable to control or trust your Akbash Dog. So stricter measures need to be taken with Akbash Dogs, and you shouldn't be afraid of using some light negative measures to correct for bad or authority-challenging behavior. Control over the feeding of your dog--refusing to feed your Akbash Dog until he or she performs commands appropriately--may seem harsh, but is one of the most effective ways to ensure that the dog views you as its master rather than as a potential rival in the pack hierarchy. A stern tone of voice is also useful, and a willingness to physically restrain the dog from performing anti-social or destructive acts is necessary in order to quickly correct for this kind of behavior. The dogs should be restrained until they show signs of submission--rolling over to show their stomach, for example, or licking/begging behaviors. It's important to start this heavy training early in the dog's life simply for practical reasons--while it's easy to physically restrain a twenty-pound Akbash puppy, it's much more difficult to restrain a hundred-pound mature dog. The earlier you eliminate problematic behaviors, then the easier you'll have it when it comes to aggressive behavior in later life. The period of time between six months and a year in your Akbash puppy's life are critical ones for training, and will probably require the most effort on your part in order to ensure good behavior as an adult dog. Akbash Dogs shouldn't be left unattended with children or other animals during this time, as their natural rebelliousness and challenging disposition could lead to serious problems with discipline or extremely unwanted behavior. In order to ensure that the Akbash knows that he or she is lower in the pack hierarchy, make sure to keep a short metaphorical leash on your dog during this crucial period of time. If you do your work adequately early on, then your Akbash Dog will be all right for the most part as an adult. Periodic challenges to the pack authority will still occur, however, and you need to be aware of these and willing to combat these as soon as they happen in order to ensure that the work you put into early training isn't compromised by later lapses in authority.